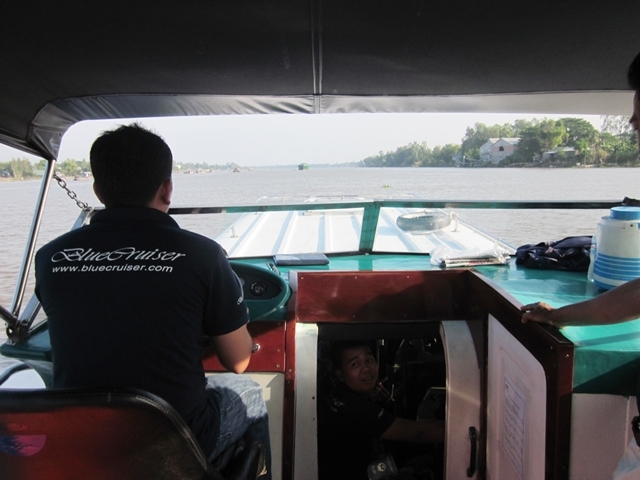 The day started with our second boat ride on the Mekong. 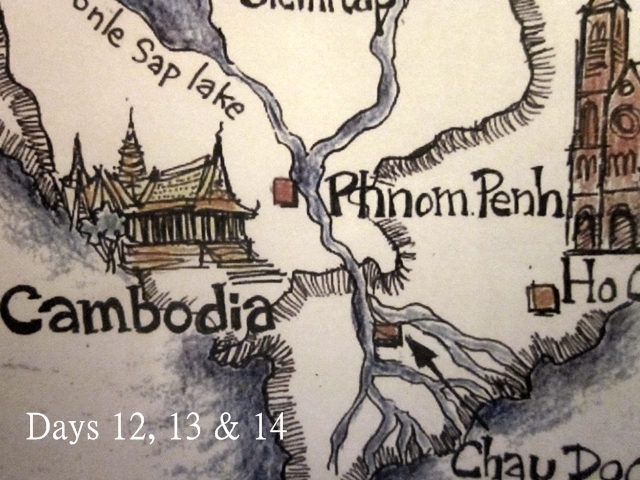 (The first was in Laos to the Buddha Cave) This one was in Chau Doc. 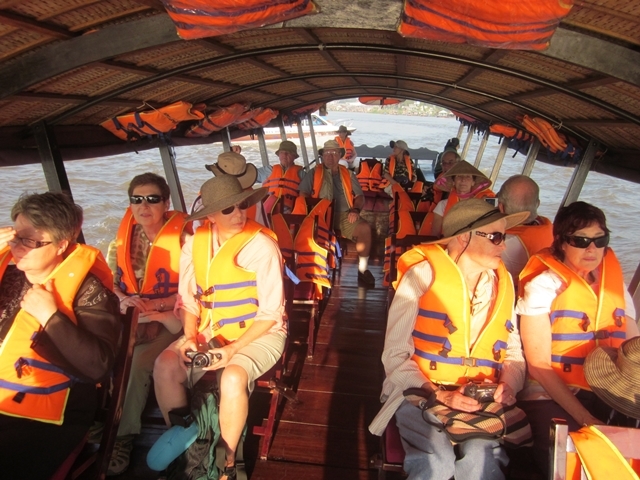 We donned our vests and headed out to the floating market and fish farm. 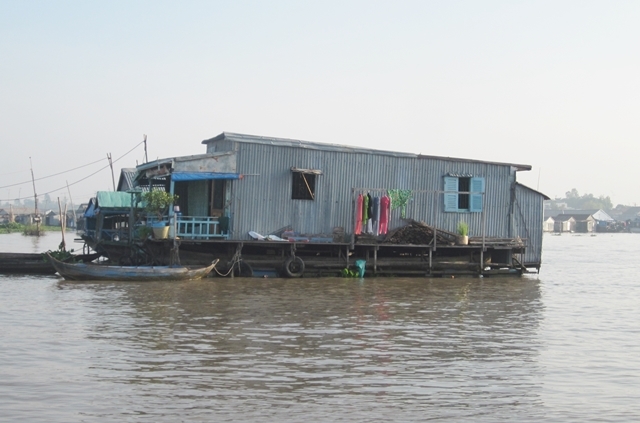 We passed many house boat in the river near Chau Doc. 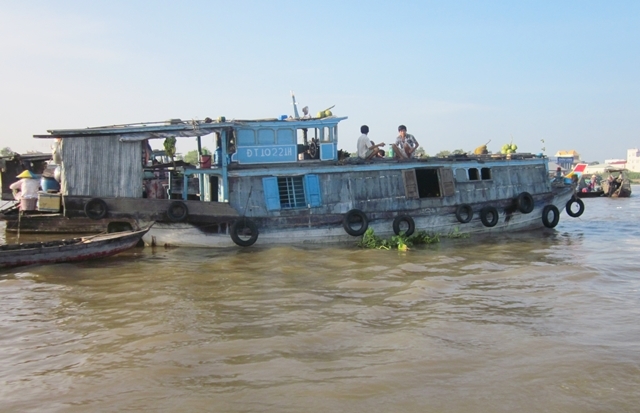 They were being supplied by boats carrying produce and picking up fish. 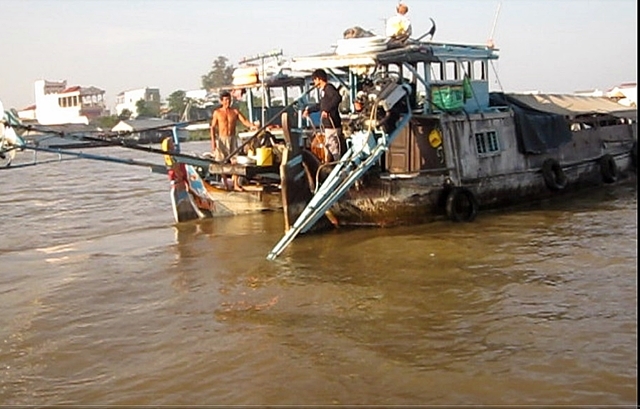 The Mekong produces a phenomenal amount of fish in spite of it’s muddy look. 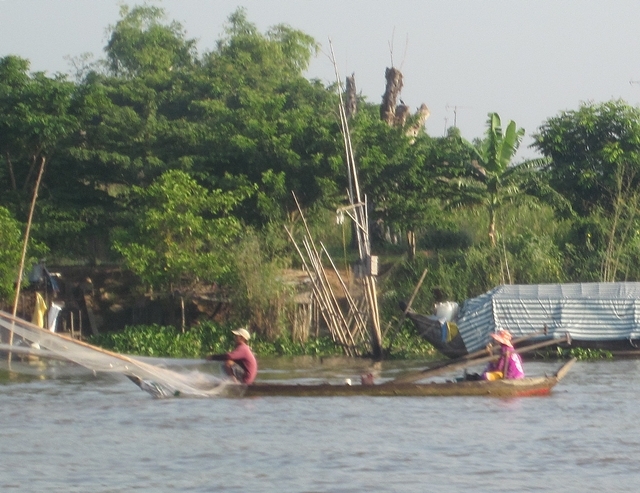 There were even very small boats fishing. 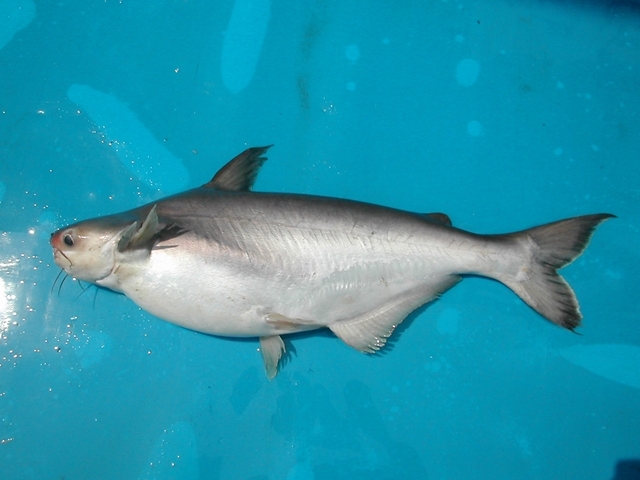 The guy in this picture would scoop his net into the water and pull up piles of little silver fish. Just the size for a wok!! 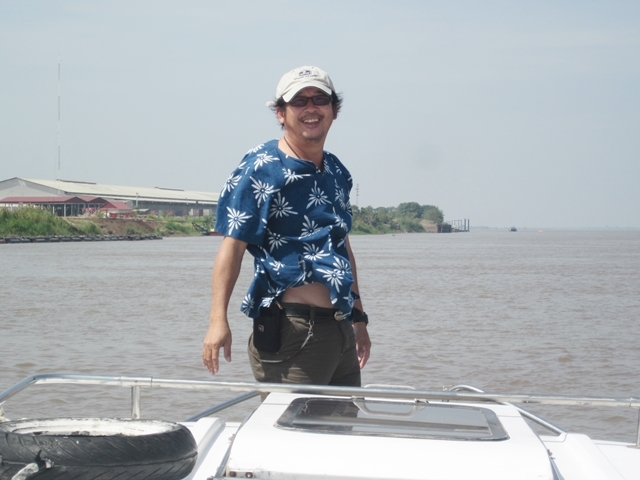 Note the water hyacinth in this photo. 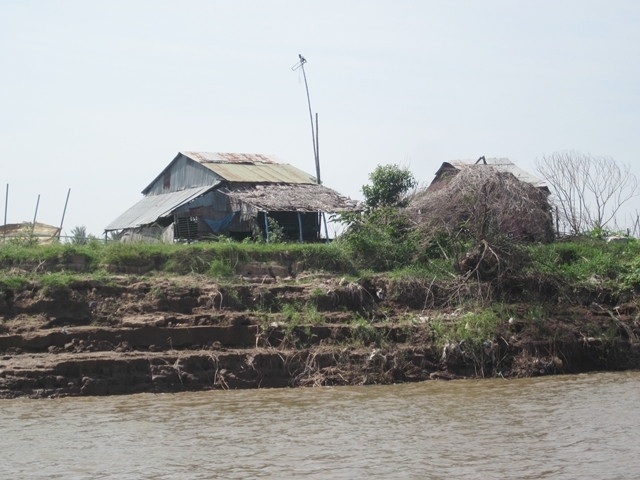 Along the Mekong, water hyacinth mats clog waterways and canals, making boating and fishing difficult. 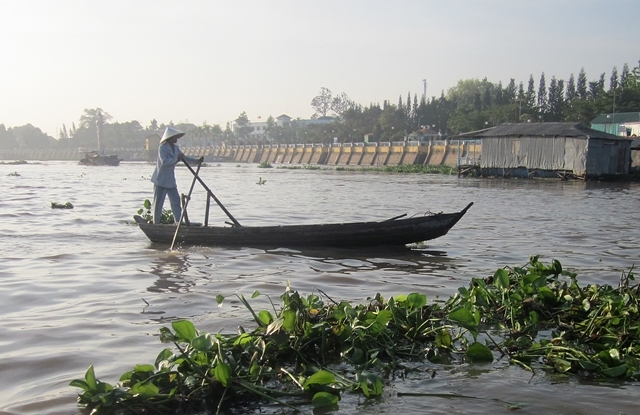 Water flow through water hyacinth mats is greatly diminished, an acre of water hyacinth can weigh more than 200 tons; infestations can be many acres in size. Water hyacinth mats degrade water quality by blocking photosynthesis, which greatly reduces oxygen levels in the water. 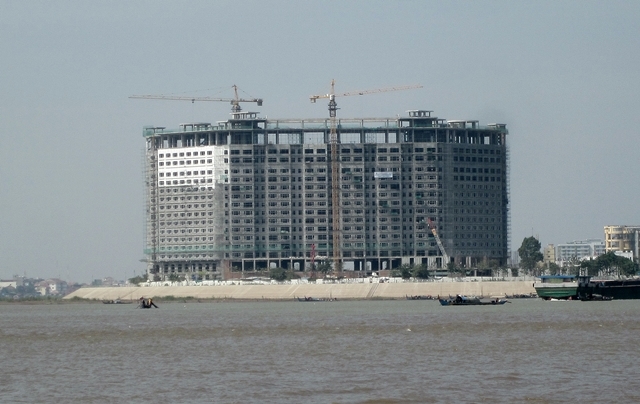 This creates a cascading effect by reducing other underwater life such as fish and other plants. Water hyacinth also reduces biological diversity, impacts native submersed plants, alters immersed plant communities by pushing away and crushing them, and also alter animal communities by blocking access to the water and/or eliminating plants the animals depend on for shelter and nesting. 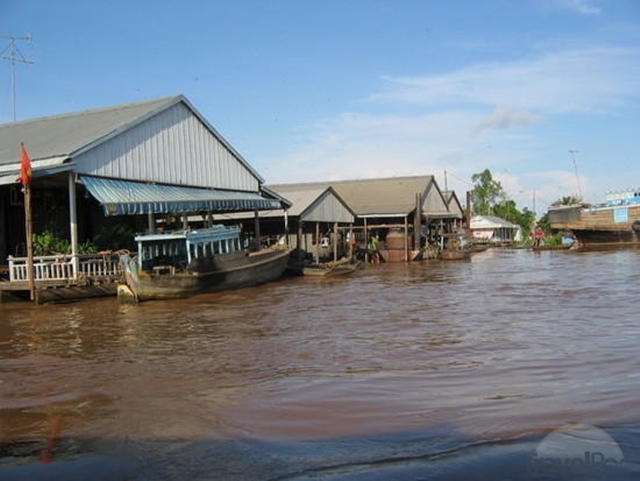 Recent studies in the Mekong delta have shown that it could be used for many purposes for improving income and livelihood of farmers by producing biogas and electricity, organic fertilizers, handicraft products, mushrooms, ruminant feed sources, and reducing the water pollution. 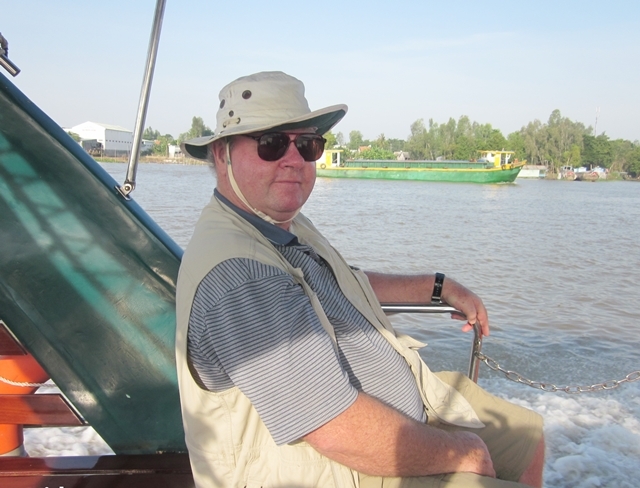 Our last stop, before leaving for Phnom Phen was at a floating fish farm. 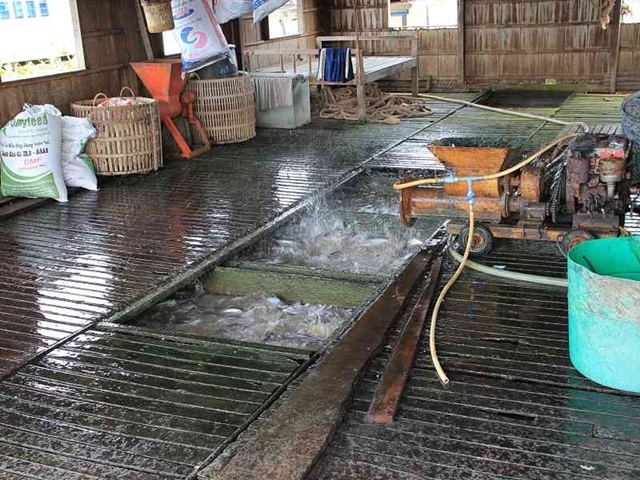 These farms raise tons of fish in big screened bottom tanks. 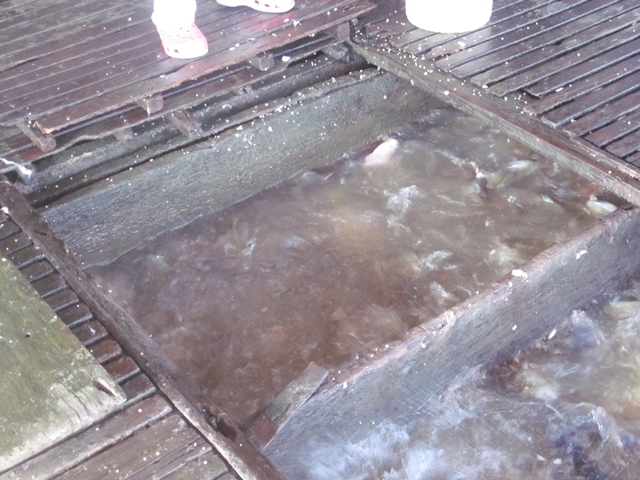 The screen allows river water in and fish poop out. I bet much of our fish in the US comes from farms like these! Basa is one of them. 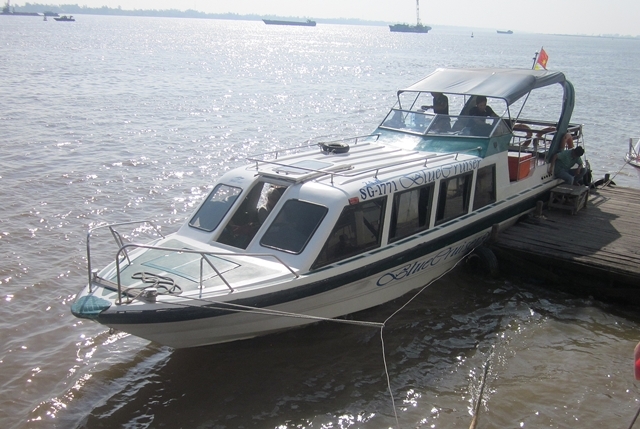 We left the slow tour boat and boarded a fast boat for the 5 hour trip to Phnom Penh, In about 1.5 hours we arrived at the Cambodian border station. 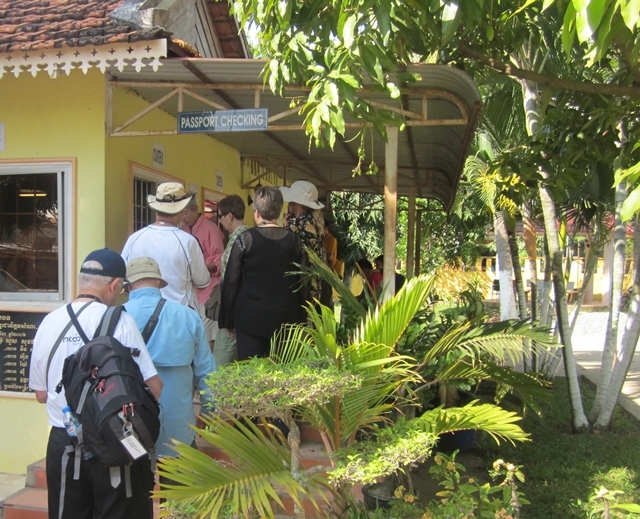 We all trooped shore and had our passports and visas stamped 3 times. 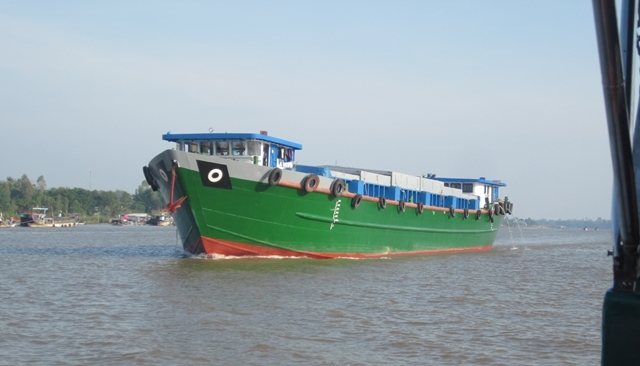 These are some scenes along the river: A river barge. 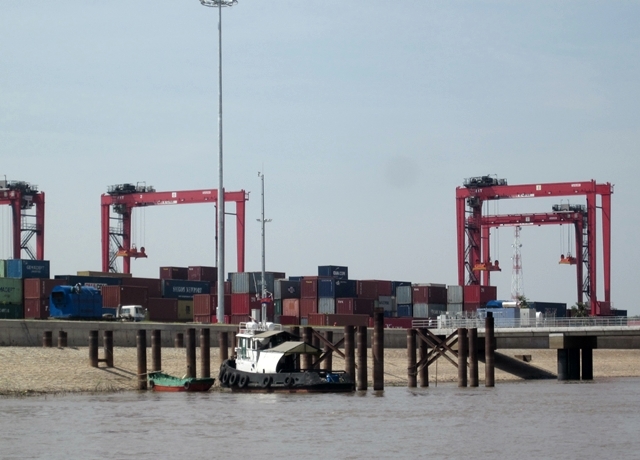 Yes, some very big ships sailed the Mekong. 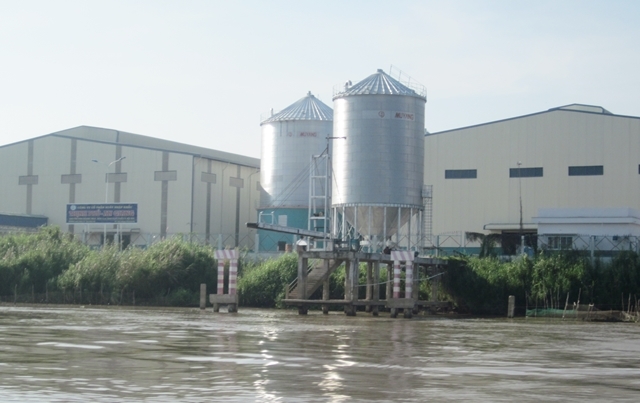 A rice processing factory and warehouse. 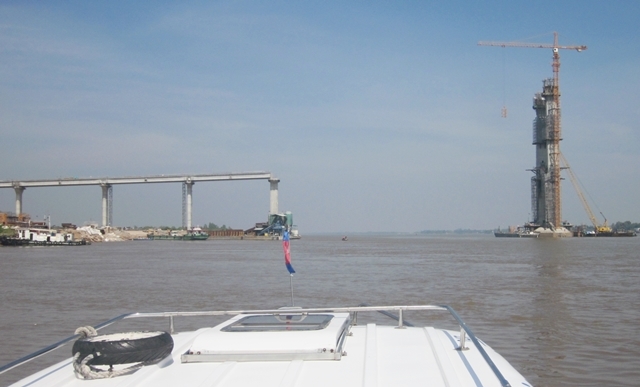 An unfinished bridge. 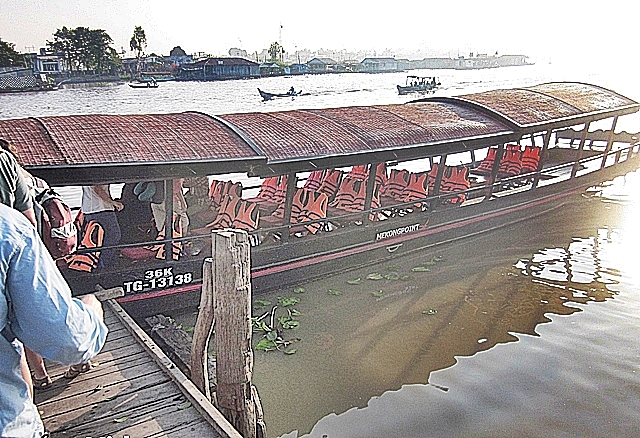 Ole showing the boat captain the way. 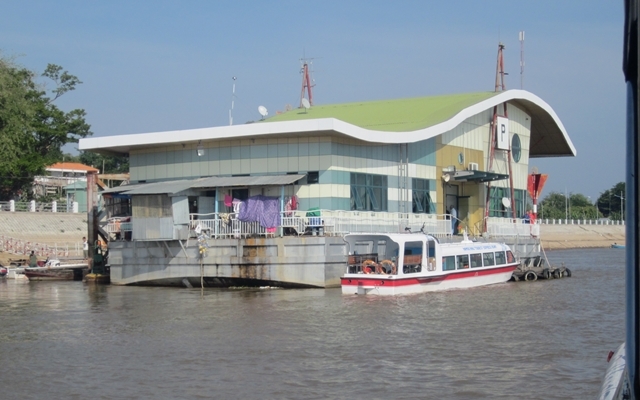 At 1 PM we arrived at Phnom Penh, Cambodia, for a 3 nights stay. 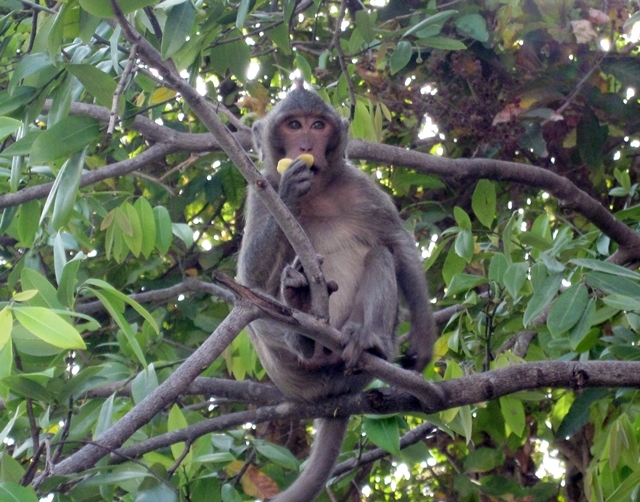 We met Nie, our Cambodian country guide. She was a sweetheart! 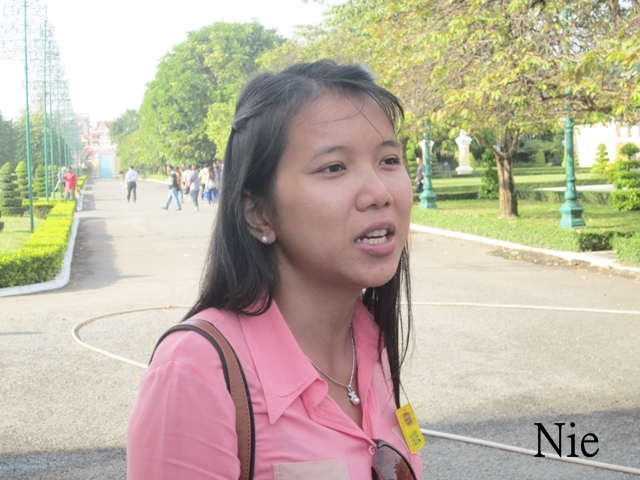 She knew a lot about Cambodia’s sad past and how it affected her family. Also, she could do this with her fingers. Ouch!! 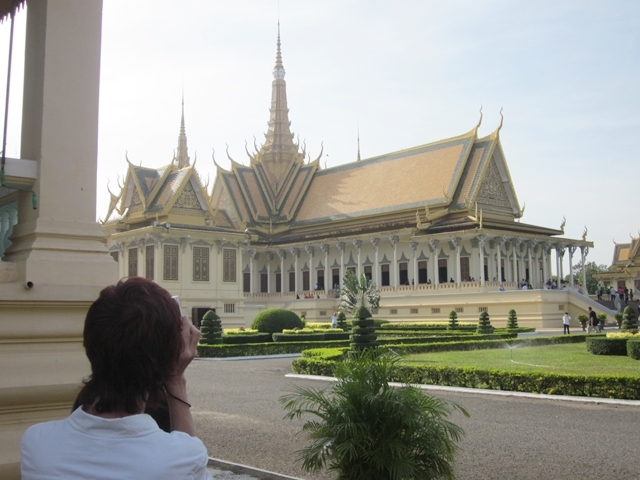 Nie gave us a tour of the Royal Palace. 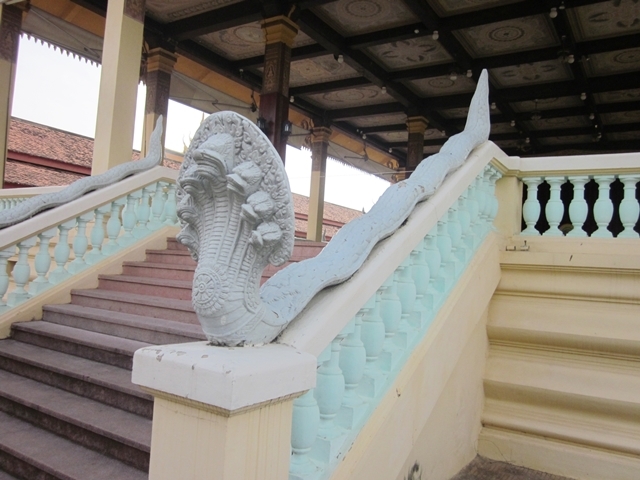 Note the beautiful buildings and the Nagas on the roof eaves and stair railings. Nagas’s tail is at the peak and his head is at the bottom. Here’s a 7 headed Naga. 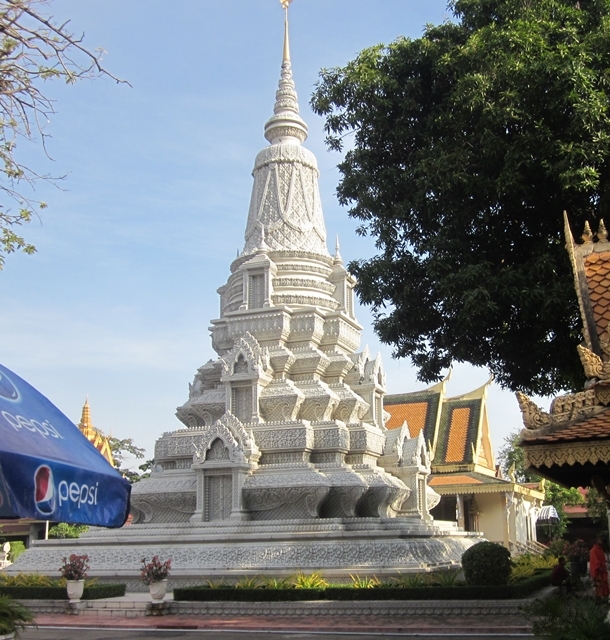 This is the Silver Pagoda. 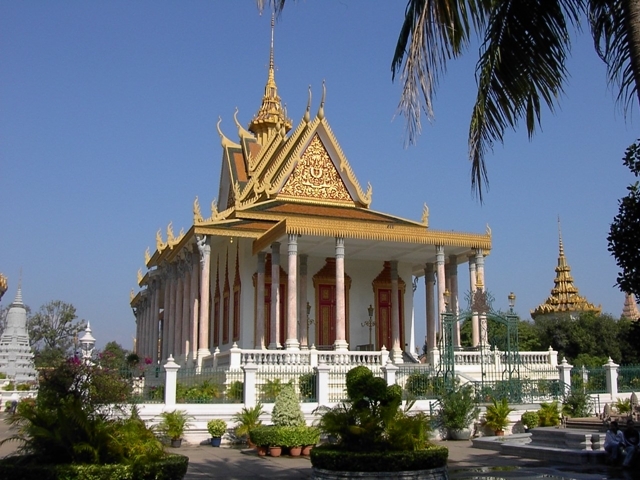 It houses many national treasures such as gold and jeweled Buddha statues. Most notable is a small 17th century baccarat crystal Buddha (the “Emerald Buddha” of Cambodia) and a life-sized gold Buddha decorated with 9584 diamonds, the largest of which weighs 25 carats. It was created in the palace workshops during 1906 and 1907, the gold Buddha weighs almost 200 pounds. 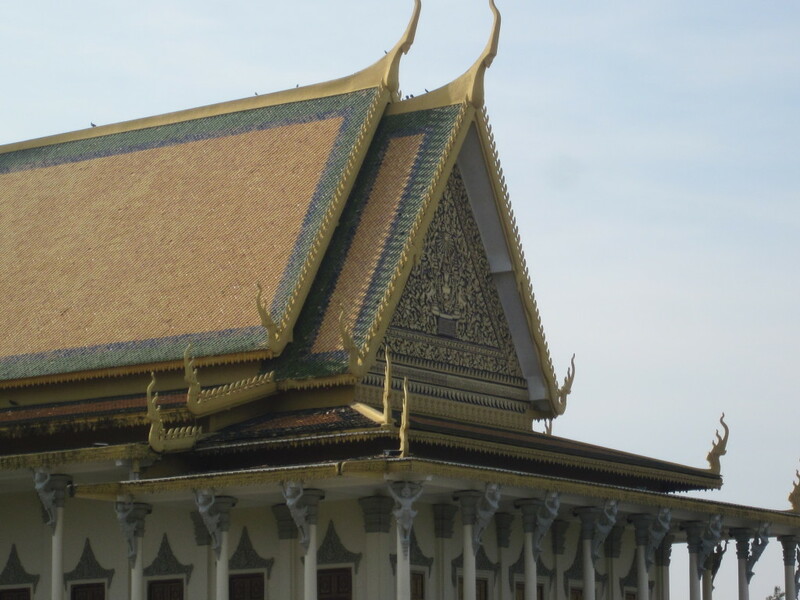 During King Norodom Sihanouk‘s pre-Khmer Rouge reign, the Silver Pagoda floor was inlaid with more than 5,000 silver tiles weighing over 5 tons. Only a small area of these tiles are available to be viewed by the public on entering the pagoda. 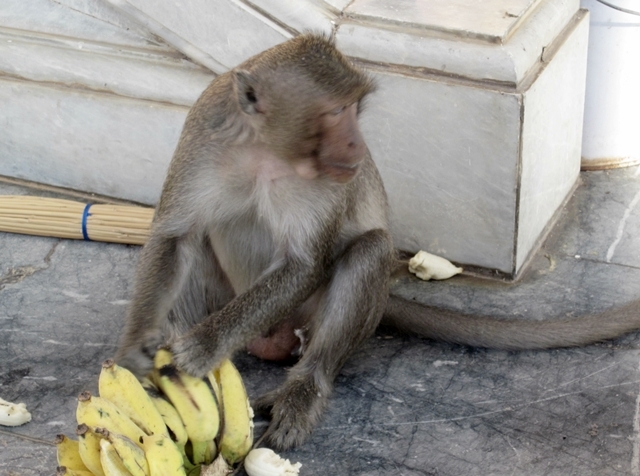 We finally got a look at temple monkeys. And, no, they didn’t steal anything. 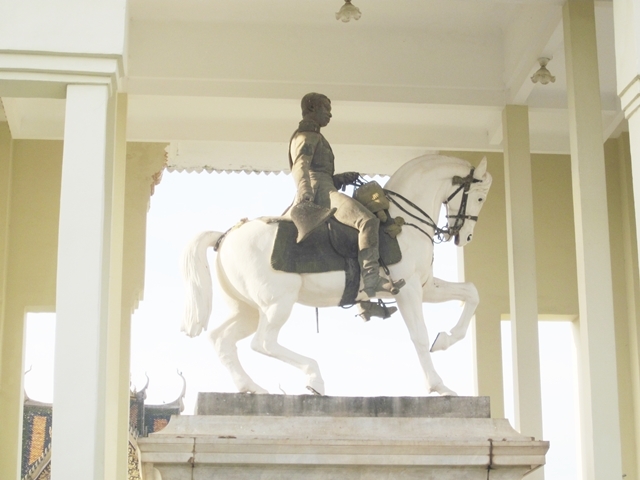 This statue of king Norodom was completed by French artist Eude in 1875 in Paris and placed on the pagoda grounds in 1892. The canopy was added by King Sihanouk in 1953 to honor King Norodom in light of Cambodia’s new independence. Legend has it that it’s was originally a statue of Napoleon, but the head was replaced with the Kings. Who knows? 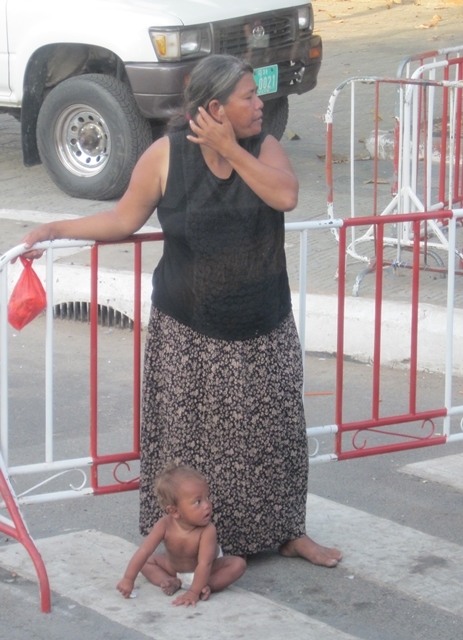 Outside the Palace we saw beggars with missing limbs and this woman with a “rent-a-baby” used to elicit sympathy and money. We were told not to give! 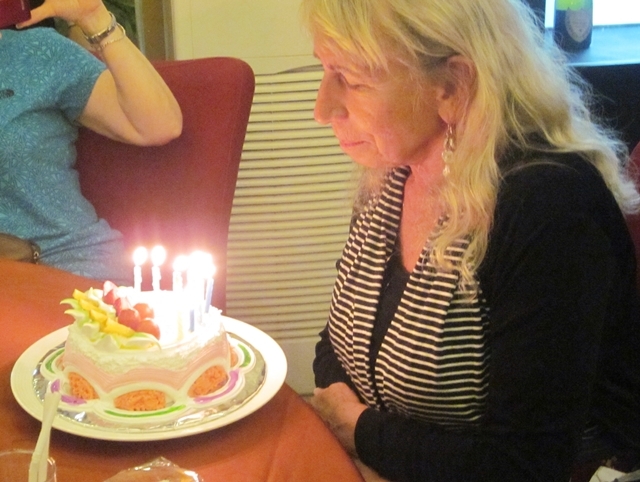 That evening, back at the hotel, we had a happy birthday party for Carol. 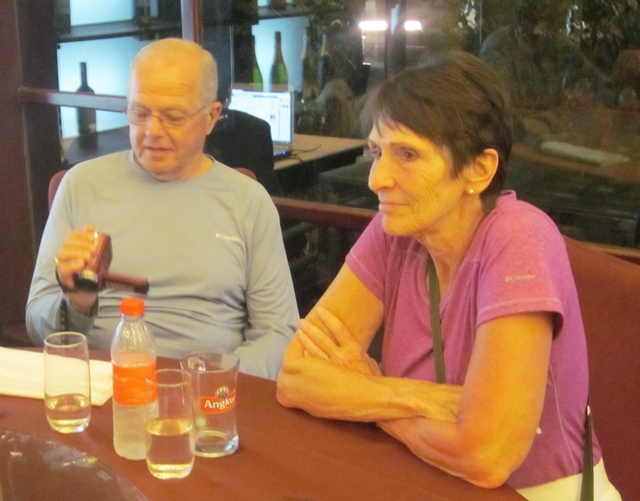 In attendance were Jerry and Donna Ashkey fron Oregon. This was the first picture that I took of this nice couple together in 12 days! So ended Day 12. Off to bed in the Almond Hotel.